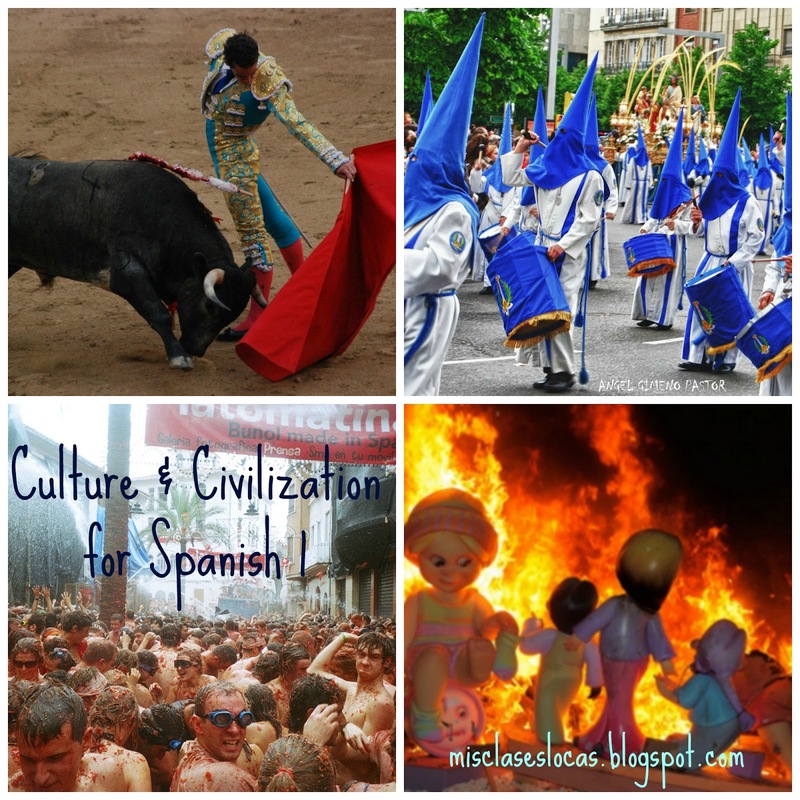 This year with our switch from trimesters to semesters, I have the opportunity to teach an optional extension to Spanish I. I decided to title the class Culture & Civilization (title from Kara Jacobs) and focus on comprehensible culture. Since it is an optional class, I wanted it to be fun and interesting, while still providing the needed input in Spanish to help these students be better prepared for Spanish II in the fall. I sent out a Google form to those signed up with many culture ideas that we could investigate and learn about as a class, including: lucha libre, bullfighting, medio ambiente, immigration, health, superstitions, biblioburro, native civilizations, la guerra sucia, guachos, yipao parade, fairy tales, geography, la tomatina, geography, culture of piñatas, specific countries of study, music, food, holidays, etc. Their results guided my planning of this class. Since they wanted to learn about such a wide variety of topics, I decided to keep most as short cultural mini units. This way no had had the chance to get bored and everyone gets to learn about their number one choice. Also, I wanted our study to be currently relevant, so as much as possible we studied festivals and celebrations that were happening at the moment. In addition to our units, students completed 5 points bi-weekly of choice real world homework, to make sure they were also experiencing culture locally and outside of class. Many thanks to the wonderful resources of others, which made planning these units so much easier! Below are the units we have completed so far, as well as our tentative plans for the rest of the trimester. See my plans for this mini unit by clicking on the image below. See Martina Bex's plans for this mini unit by clicking on the image below. I decided to do one culturally centered novel in this class and knew Tumba would be the perfect fit. 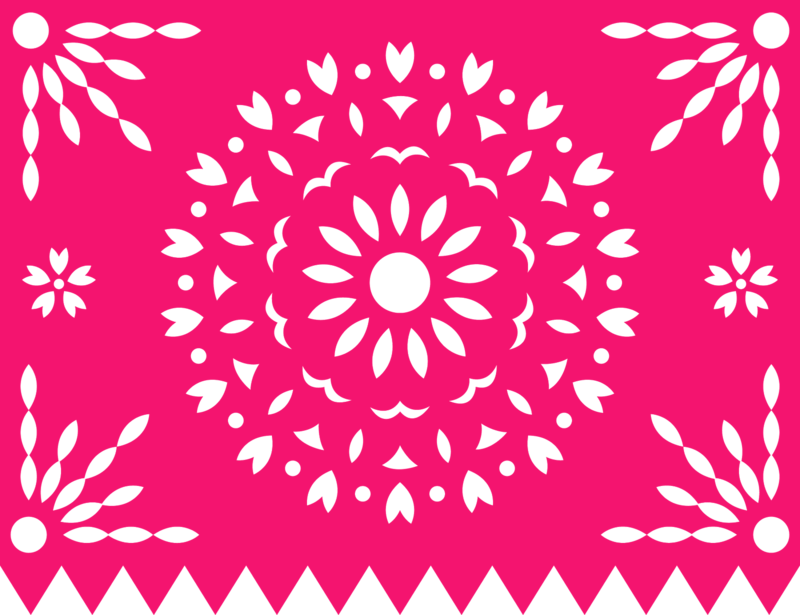 Using the teacher's guide would be a great way to talk about The Day of the Dead, as well as many aspects of the culture and history of Mexico. See my posts for this novel unit by clicking on the image below. See Elizabeth Dentlinger's plans & resources for this mini unit by clicking on the image below. Have you seen all of the wonderful resources she has posted for this unit for free! Mil gracias! I have not planned this unit yet, but plan on doing something similar to Kara Jacob's Gastronomia unit, focusing on the cuisine of a couple Spanish speaking countries. I know I will use many of the awesome Zachary Jones activities such as "¡Qué rico!". I figure this will be a fun and lighthearted way to end the year. It was their top pick, probably because they have hopes of being able to try food out in class ;) I would like to include an end of year field trip to a local authentic Mexican restaurant is possible. It is pretty awesome to not have any focus on certain sets of vocabulary or grammar and to just teach Spanish with culture at the core. This class has shown be that ANY language class could ultimately be set up like this, but with a better planning of targeted high frequency vocabulary. 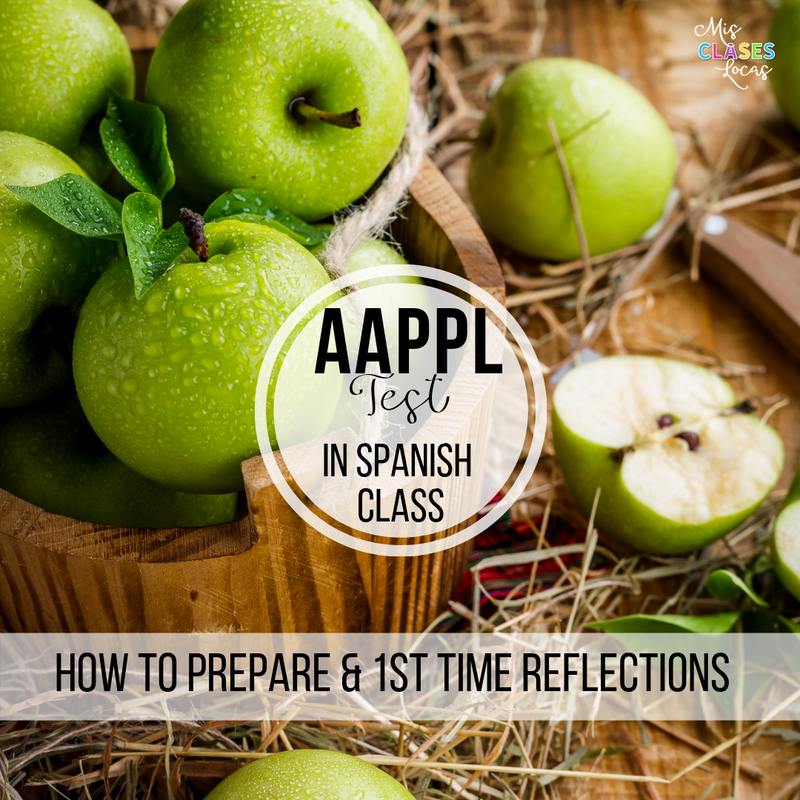 Overall my goals for this class are to help struggling students be better prepared for Spanish II, while meeting the following essential standards related to both culture and communication in Spanish. Have you ever done a class like this? What did you include? Students in a local English class were asked to write a classification essay where they categorized and then explained with justification. One student wrote an essay organizing teachers into categories, and some of it is pure gold. The categories include "listers" (substitutes who just read monotonously from a list all day and then online shop), "soon to be retiree" (if you get them off topic, you will be indulged in life lessons and hilarious stories), "rulers" (mean teachers who do not want you to have fun, but to learn), and my favorite, "freshies" (first year college graduate teachers), who I will focus on. 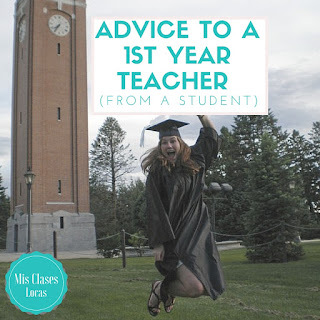 You see a lot of advice for new teachers coming from seasoned teachers, but not often coming from the students themselves. Here is how one high school senior sees new teachers fresh out of college. The student says, "usually these new high school teachers will lack the discipline needed to keep the classroom under control; they allow swearing, back talking, and all around lack of authority." New teachers lack experience with behavior management, while students have had years of being professional trouble makers. What can you do? Get as much experience first hand of management opportunities as you can before your first year. Volunteer or substitute teach at inner city schools, Boys and Girls clubs, special education classrooms, summer camps, or any time where you may be faced with a chance to try out your management skills. Having pretty expectations posters is great, but if you have not experienced being in the trenches, you will be caught off guard on many occasions by these profession trouble makers, who are just trying to test your authority. High school students know when they have a first year teacher. According to the essay, "students think new teachers are a joke and can learn nothing from them because they have no experience." Students assume that their class is being used as a trail run, and do not like to have their time wasted. What can you do? Show your students that you know your stuff. Brag on your accomplishments. Be confident and fake it til you make it. At the same time, if you do not know the answer to a question, instead of making something up, be honest and use it as a learning opportunity together to figure it out. Even with the best preparation, a first year teacher often walks blindly toward the end of the day, week, quarter and school year with just a hand drawn map they made themselves. According to the student, "Freshies have the hardest job of all teachers because they have almost no idea what they are getting into with the students or the curriculum." It goes on to say that if new teachers persevere, they can become great teachers. What can you do? Find a mentor. This may not be the school assigned mentor you were assigned to, but instead a like minded teacher of the same subject you met in #langchat on Twitter. This is especially important for those of you who will be a department-of-one. These mentors can really help out with the curriculum side, while fellow teachers in your school should be your go to people with questions about particular students. It is better to ask then continue to walk blindly alone. it is so much better with someone by your side, coaching and cheering you on. The student ends by saying, "all teachers have your best interest at heart." If you can get across to students that you care about them as people, then you are on your way in the right direction. So whether you are a "freshie" or a "soon to be retiree," remember that your students are watching your every move, and may even be categorizing you as well. If you persevere, you too can be a great teacher. In my Spanish 1 expansion course this trimester, culture & civilization, I sent out a Google form with many culture ideas that we could investigate and learn about as a class. One of their top choices was the Guerra Sucia in Argentina, so this is how we started the class. 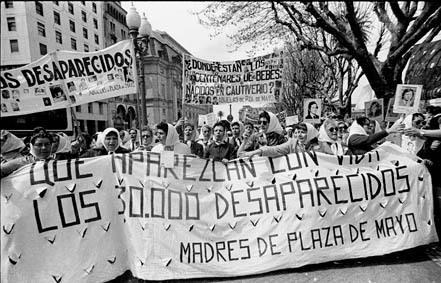 We started with this comprehensible culture unit from Martina Bex about the Madres de la Plaza de Mayo. We went through the discussion questions, Spanish language cultural reading, comprehension questions, listening activity, and slide show. We also did the song activity for Maná - Desapariciones. (We saved the interpersonal discussion questions and writing activity for the end of the unit assessments). 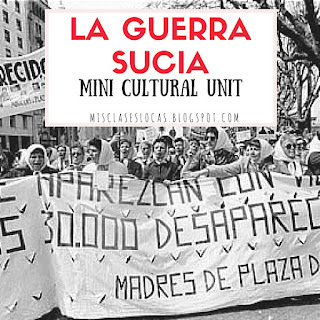 Since the students seemed to be craving more in relation to the topic, we investigated further with Guerra Sucia Stations by Kristy Placido. They made for good independent work for students, while providing more material and opportunities for discussion. We then watched the 1985 movie La Historia Oficial with subtitles in English and using these movie questions in English to keep students focused, and provide more discussion. It is rated R for some language, but all students and their parents signed a permission slip for class. It is a little slow, but does show the perspective of the desaparecidos from another side. If this was an upper level class, we would have read the TPRS Publishing novel La Guerra Sucia, but it is too far out of the language range of this particular class. Also, our plan is to investigate many mini cultural units for only about a week or two each. For assessments we used materials from Martina Bex's unit . Students used the interpersonal discussion questions cards as an informal assessment, while I circulated and listened. Then individually they did the writing activity, where I just wanted them to write in Spanish about anything they learned from the unit. 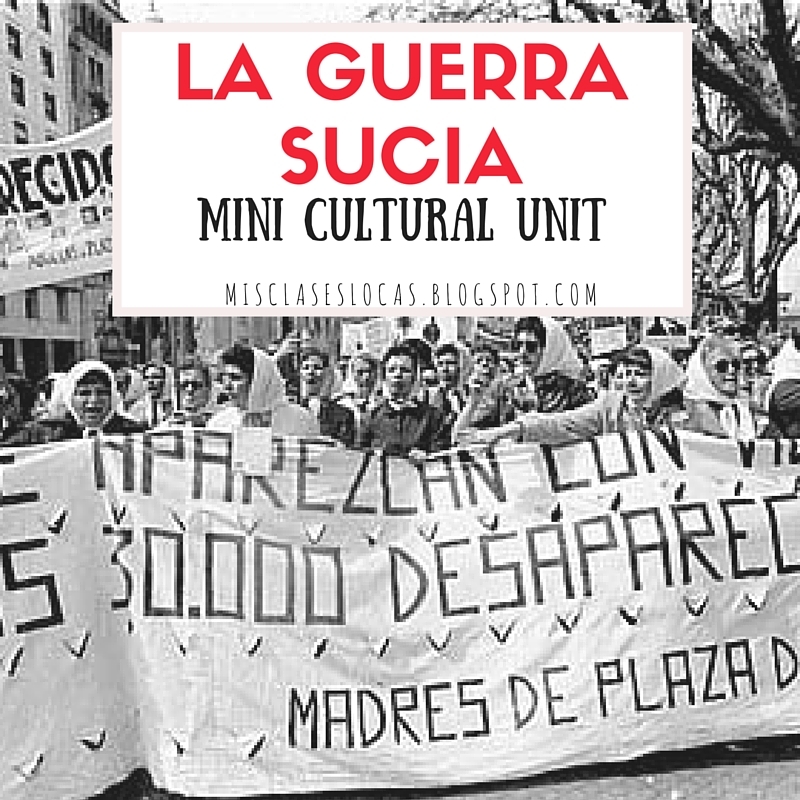 What are your favorite resources for teaching about La Guerra Sucia? Here are some other mini cultural units that I have used in the past or plan to use this year. One of the perks of my one trimester Spanish I expansion class, Culture & Civilization is I have endless possibilities of incorporating current cultural events. I just decided yesterday that for the end of next week I want to focus on the Spanish festival Las Fallas, which takes place March 15-19. I was given the idea by another teacher in my local Spanish department-of-one monthly Cedar Valley Northeast meetings. She mentioned how last year one of her small classes created cardboard "ninots," and then went outside to light them on fire. While I am not sure is I can get away with the fire part yet, I do plan on studying this celebration with using the resources below. I plan to use this Las Fallas - Slideshow to guide our exploration and discussion.The students will be filling out this Las Fallas - Note Sheet to help keep them organized and focused. (Please feel free to use these resources, but let me know if there are any errors I need to fix as I threw them together quite quickly, and do not post them as your own). NEW @HolaDMSSpanish shared a great "hook" for this unit. It would be perfect to have this cute video & song playing as students enter. I plan to start with a PQA discussion in Spanish talking about our local festivals and leading into the basic of Las Fallas. We will watch the video below, pausing for discussion. Then students will be let loose with their Chromebooks to explore the following resources. They will fill out their Las Fallas - Note Sheet to organize their findings. 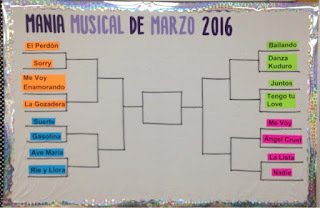 Veinte Mundos - article, quiz & videos. We will all come together and share our resources, discuss in Spanish, as well as go through the rest of the Las Fallas - Slideshow, focusing on the specific parts of the events. We will also watch some authentic videos of the event parts as well. Depending on time we will hopefully then create mini cardboard or paper mache "ninots," that can either be ceremoniously burned here or at home. 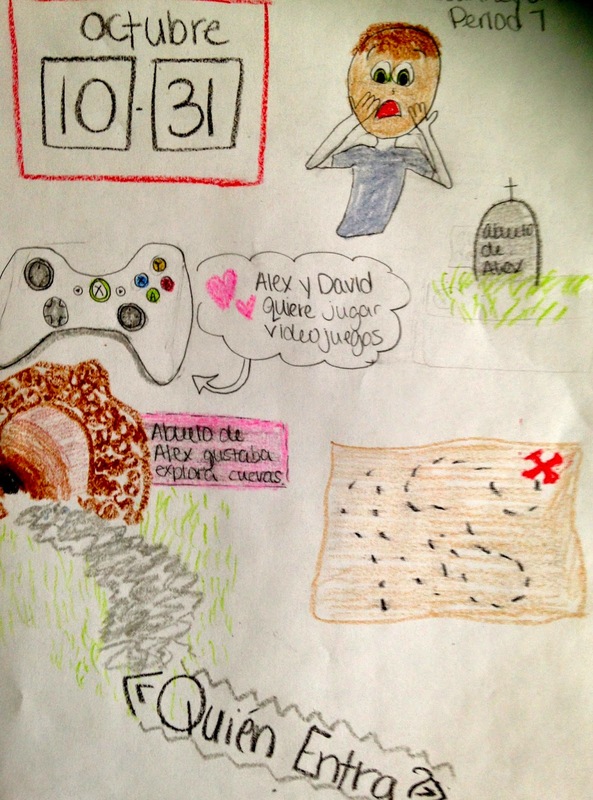 We will probably end with a free write, where students share as much as they can about Las Fallas. 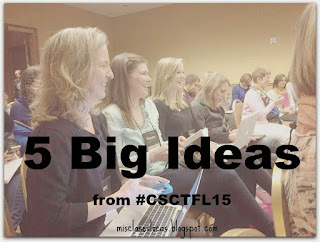 What other great resources do you have to share of this event? Today marks the start of the 3rd trimester. This means there are only 12 little weeks before summer starts. The only problem is that in my school there is NO spring break, so this trimester is like a marathon without a water break. Here are some ideas to hopefully bring some sparkle into your March as we wait for the warm weather and flowers. I am aware that this is not a holiday that is normally celebrated in Spanish class, but I come from a family that is 100% Irish, meaning it is one of the most important days of the year. 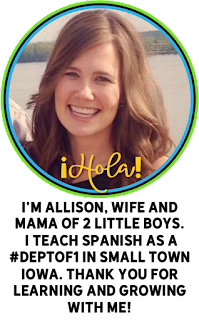 I love the new resources below from Kristy Placido that DOES have a cultural link from St. Paddy's day to Chile. Plus, you get a bonus throw back of my buddy as a squishy green leprechaun. 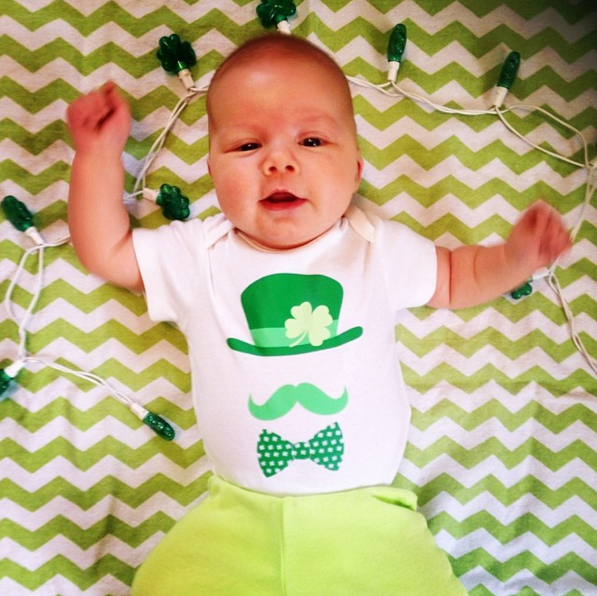 Throw back to my little leprechaun 2 years ago. Unless you have been living under a social media rock, you have probably seen the many awesome brackets going around. With the start of the trimester today, the madness starts NOW! I am pretty bitter that I do not get to attend the best conference I have ever been to again this year. I plan to live vicariously through the hash tag, but it can not come close to the amazingness of meeting #langchat royalty in person. To relive a little of the greatness here are all of my posts about CSCTFL15. Good thing I already submitted a proposal to hopefully present at CSCTFL17 in Chicago! 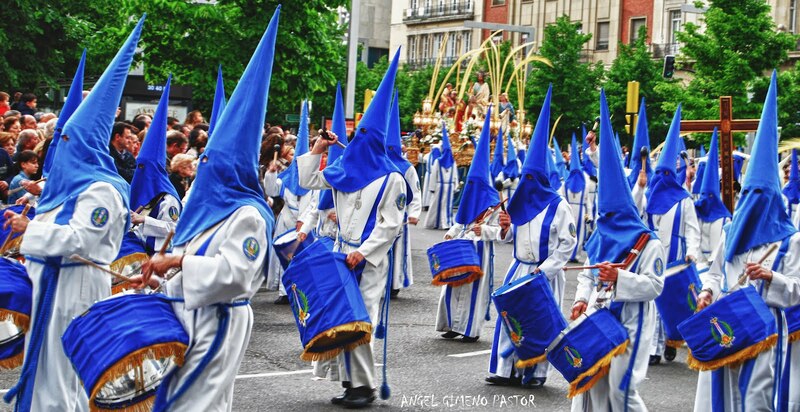 While I am no longer at a catholic school, I still plan on doing a week long mini unit on Semana Santa in my level one culture and civilization class. It will be centered around this Martina Bex Unit. Make sure to submit your proposal to present at the first ever Comprehensible Iowa Conference on June 18 in Nevada, Iowa by March 18! Or just sign up to attend what is going to be a great day of sharing and learning! I hope to see many of you there! 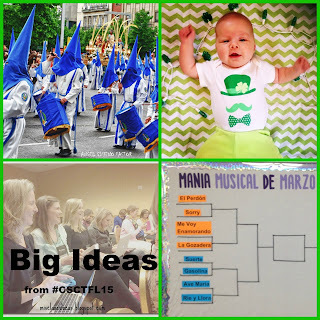 Check out plans for my mini Las Fallas unit. 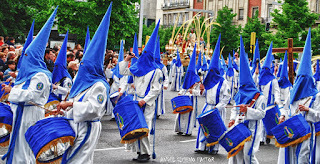 The festival takes place in Spain on March 15-19. 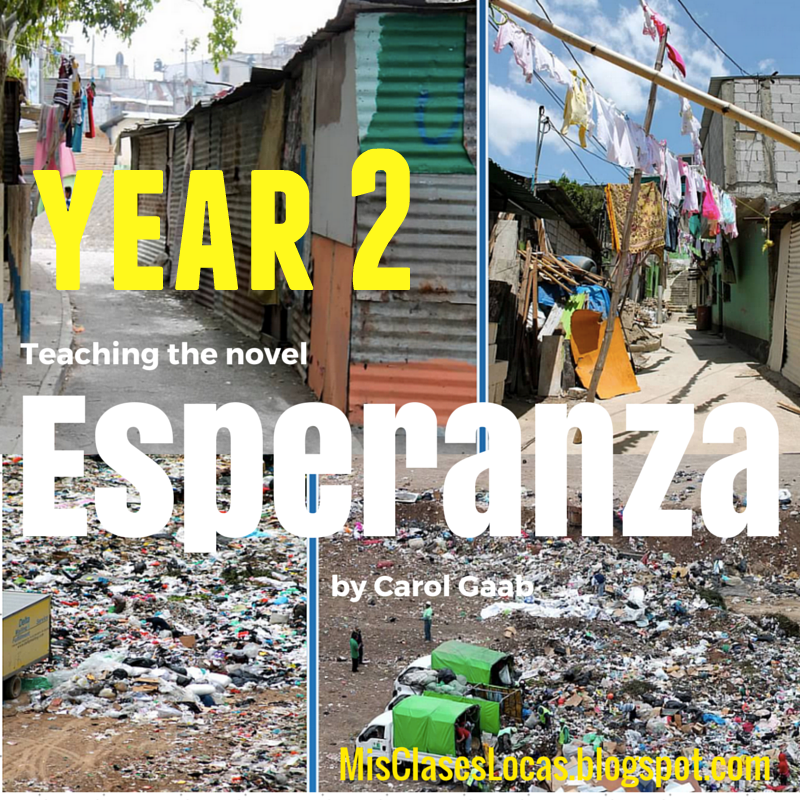 I just finished teaching the novel Esperanza by Carol Gaab for the fourth time in two years. Last year it was the first novel my Spanish III class ever read, and then my Spanish II class read it semester 2. This year at a new school, Spanish III read it trimester 1, and my second class of Spanish III read it trimester 2. I know that it is marked a "level 1 book" and is in the present tense, but I would personally shy away from reading it in Spanish I due to the deep themes and discussions that it brings up about social justice and immigration. If you are going to teach it, I would high recommend the Teacher's Guide & Audio Book. Here is my first post about teaching Esperanza after year 1.